AWAY at Dulwich next Tuesday 11 July. To the rather more that 'background' musical accompaniment of Geno Washington and Jess Glynn, playing Henley Festival across the river, PCC lost a close match 1-3 to Eynsham this evening. In four disjointed games that could all have gone either way as 'time' approached, Frances Colman, Peter Haydon and Richard Peperell all came of second best, and Chris Roberts sneaked a single point win the last turn of his game. PCC 'AC Handicap': Chris Roberts (1), Frances Colman (8), Peter Haydon (10), Richard Peperell (11). Our AC handicap team lost agin this morning, this time to our crqouet neighbours High Wycombe. Our unchanged team recorded the same 1-3 reverse with Peter Haydon recording the only Phyllis Court victory. 9 July - Roberts runner-up (again!) at Ryde Open, as Hopkins wins the plate event. Chris Roberts was beaten in the final of the Ryde Open for the second year in a rowand fouth time over-all, this weekend on the Isle of Wight. All four Phyllis Court players who made up the biggest visitor representation at this event, qualified for the knock-out stage. Roberts defeated Carole Jackson and both David Hopkins and Roger Goldring also departed the main event at the quarter-final stage. Hopkins went on to win the consolation plate event (so finishing fifth over-all) and for once the plate trophy that he brought home, was indeed an actual silver plate! Roberts beat local man Roy Tillcock surprisingly easily in the semis but then found the rapidly improving top seed Stephen Custance-Baker's ball returns to position in a close final just too consistent and so he had to be the 'bridesmaid' yet again. I am sad to have to tell you that our member Ken Shaw has died. opportunity to play in the colours of his native South Africa in our first Olympics Tournament in 2012. Funeral and other details will appear hear as they become known. 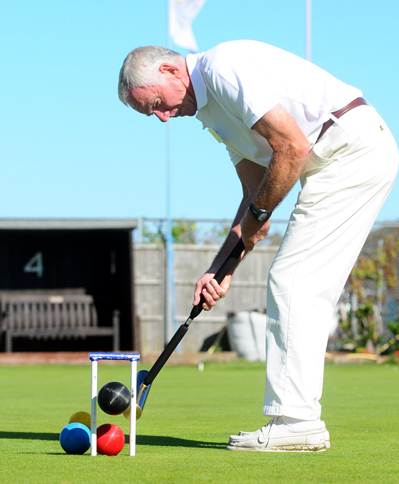 News has just reached us that Richard Peperell continued to reap the rewards of his improving Association Croquet skills with a third tournament win of the season, this time in far off Ramsgate last weekend. 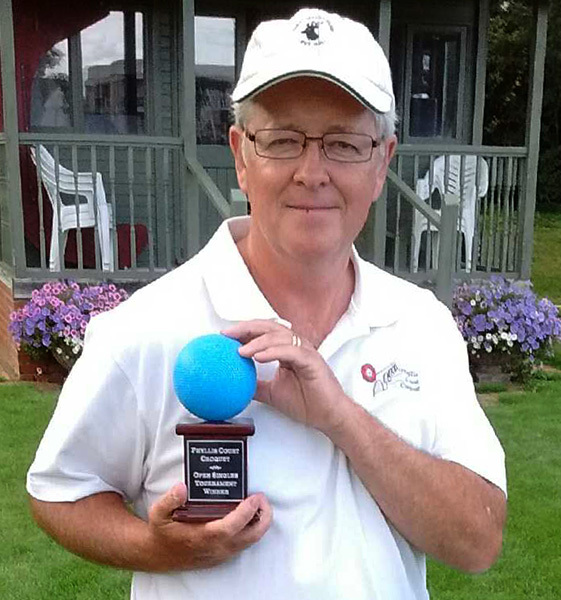 Peperell was undefeated in his five games over the weekend in winning the host club's open handicap event. 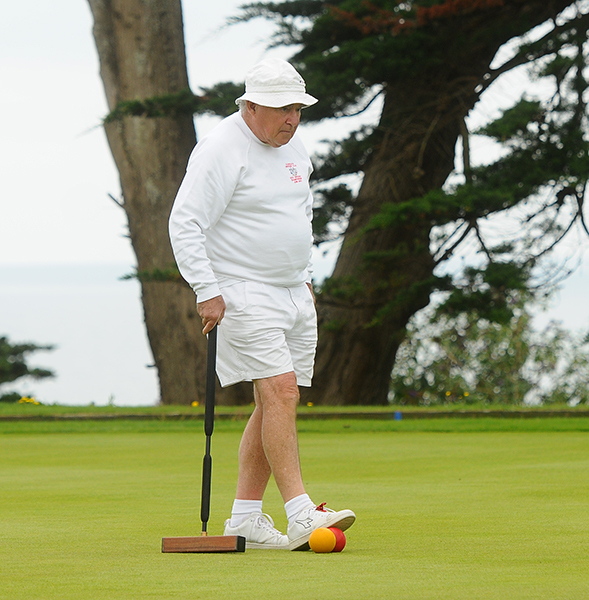 He faced opponents with handicaps from as low as 2 up to matching his own 11 grade, and on this form, croquet's automatic handicapping system will soon adjust this local man's mark down still further from the 14 he started his season on. This latest success follows Peperell's previously reported tournament victories at High Wycombe and Roehampton. Dulwich were just too strong for our top side today in the National Inter-Club Championship and they ran out comfortable 1 - 6 winners. Ian Norris was our 'hero' for securing our only match win, his ball placement precision coming into it's own on the host's very dry and fast courts where controlling the ball was difficult. He beat Great Britain AC International Mark Ormerod (-1) which was a great 'scalp' for our man. But the form man was Dulwich captain Simon Carter (-2), a really good player to have at no.3, and he won both his singles in straight games. Dulwich won the tie just after lunch when they got to 0-4 ahead but everyone wanted to play the fixture out regardless. PCC 'B' scored another good win today, extending their run of victories to four. PCC 'B: MIke Fensome (1), Raymond Wood (3), Hugh Crook (5), Colin Morgan (5). 15 July - Coates reduces handicap for THIRD time this season! A second victory in a row over higher ranked opponents in the 3+ competition saw Robin Coates handicap come down down for the THIRD time since April. This season he has gone from handicap 9 to 6 which is great achievement. Today he beat Colin Morgan (5) in three games, reprising his feat of a few weeks ago when he 'scalped Hugh Crook (5) in the same manner. Phyllis Court made history when we were were represented by no less than five players at The AC National Seniors at Budleigh this week and we had a presence in four of the five classes. Carole Jackson out-performed her seeding in the A Class, Chris Roberts stuffed a last game chance to win the B, David Hopkins was similarly in the hunt for the C and both Frances Colman and Richard Peperell got some good wins in the E (the latter finishing runner-up and reducing his handicap in this his first Advanced tournament). PCC 'A' kept our SCF Level league title hopes on course with a hard fought win against Winchester today. Chris Roberts and David Hopkins lost the morning doubles but singles wins for Roger Goldring and Carole Jackson gave our side a 2-1 lead at lunch. Roberts and Goldring then won again in the afternoon to secure a hard fought win. PCC 'A': Chris Roberts (-2), David Hopkins (0), Carole Jackson (0), Roger Goldring (1). 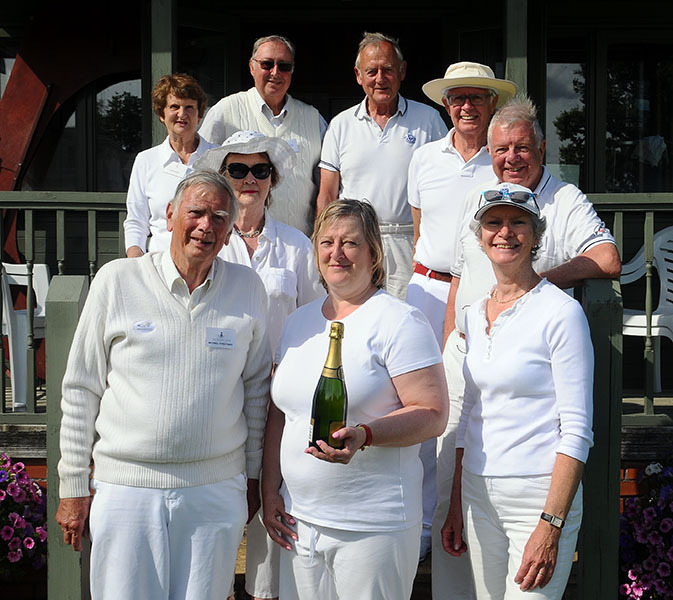 Phyllis Court enjoyed more success today when a high handicapped team won a friendly fixture at Hurlingham. Our team included Jeff Smith who was making his representative debut. More details to follow . . .
PCC 'Friendly': Dianne Browne (6), John Maguire (9), Edmund Shirley (9), Jeff Smith (9). High Wycombe's Joel Taylor and Raouf Allim scored two sixth turn Triple Peels and finished only two minutes apart in a flawless display of AC this evening, beating our side 0-2. TPs are very rare indeed at our club and this was certainly the first time ever that two have been completed here on the same day. For our side, Chris Roberts and David Hopkins didn't do much wrong in the three shots that they played each, but there was no way on to the court in such fine company and the two -26TP score lines tell their own tale. If anyone reading this wants to know just how difficult a TP is to pull off, please see Chris, Frances, Carole or David who will happily explain. Raghu Iyer was undefeated in today's AC Singles Handicap tournament, and thus will hoist the lovely Caversham Plate for the first time. Playing off handicap 16, he used his bisques in a very thoughtful manner to see off lower handicapped opponents Frances Colman (9), Richard Peperell (10), before concluding with an 18-0 victory over Chris Roberts (1). The other players all tied on one win apiece and Colman got second place on 'net points'. Joanna Iyer won today by the slimmest of margins separated a three way tie, after she had lead outright going into the last round. It took a back calculation of 'quality of opponents' to decide that Joanna was the winner ahead of Madeleine Probert and Michael Christmas after all other deciding criteria had been exhausted. The three lost only once each in their five games so ended on a winning rate of 80%, just ahead of tournament debutant Anthony Peperell on 60%. Iyer picked up the winners champagne and together with Probert was given first refusal to represent Phyllis Court at the Final of the National Grass roots (8+) competition. Unfortunately both will be out of the country on the date of the final, so Christmas will attend as our first qualifier and Peperell is checking his availability. Thank you to all 11 players who participated and congratulations to Joanna on the win. This evening Chris Roberts gave Phyllis Court a 1-0 lead in the AC A-Level League match v Aldermaston, which a narrow +6 win. The other half of the fixture is due to be played in a acouple of week's time. Raghu Iyer's PCC 'C' suffered a 2-10 loss to Wingrave at Leighton-Linslade's ground today, where our side were unsettled by the state of the courts that met them. L-L surface is well known to be uneven but additional some recent weed-killer problems had caused considerable damage. Wingrave clearly coped with the conditions better than our side but there was dissatisfaction in the 'C' camp after this defeat. The 'C' must now win their last game of the season at home to Blewbury to top their Division and reach the Federation Handicap Final. PCC 'C': Raghu Iyer (6), Dianne Browne (6), Ralph Chambers (7), John Maguire (9). Winning the Southern Federation League title just got a whole lot harder for our top side 'PCC 'A' today as they let a half-time lead evaporate after lunch. Carole Jackson and Roger Goldring each won their morning singles matches in straight games, to establish 2-1 lead in the fixture, after Chris Roberts and David Hopkins went down 6-7, 6-7 in their doubles match. Jackson and Goldring then swapped opponents but unexpectedly Ryde revised their fortunes to win both afternoon matches. The pressure was then on Hopkins and Roberts to win both their singles rubbers to save, and indeed win, the fixture. Sadly it was not to be and a jump shot at hoop 13 in a second game, did for Hopkins, so by the time Roberts won his match the fixture was lost 3-4. The 'A' can still win the league, but now require victories in both their remaining two ties, with the High Wycome fixture looking like being a title decider. We took a 'Friendly' team down to Ryde with us, and they played a shadow fixture that ended in a 4-4 draw, played along side the League game. A date clash with the PCC bridge summer lunch, robbed us of several potential players, and we couldn't find a fourth team member, so a Ryde player stood as our fourth team member. Don Rutherford was our most successful player winning both his matches. PCC 'Friendly': Hugh Crook (5), Don Rutherford (6), Deon Melck (9), Ryde guest player (9). The 80+ Singles had to be postponed today due to heavy rain. A new date will be sought - probably in September. - This evening our handicap team were well beated 0-3 at Blewbury, after Raghu Iyer's earlier game could not be played due to a court booking misundersatnding at Blewbury. Peter Haydon made a surprise appearance at the Belgian Open this weekend and made it to the knock-out stage. This year's Belgian Open was held at Ramsgate! Phyllis Court are represented by five players for the first time at The GC Veterans Championship over the next three days. David Hopkins, Carole Jackson, Roger Goldring and both Mike and Helena Fensome will contest the tournament at Southwick (near Brighton). 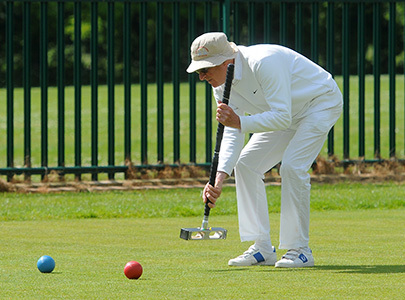 Our Association Croquet Friendly team enjoyed a spledind day at Roehampton today. Frances Colman and Richard Peperell won and exciting morning handicap doubles by a single point in a 'sudden death' finish afer the scores were ties at 'time'. Chris Roberts and Raghu Iyer on the other hand left their comeback just too late and lost by a single point. But our team really came into their own in the afternoon singles, where victories were secured by peg-outs in all four games, giving us the match win 5 - 1. PCC AC Friendly: Chris Roberts (1), Frances Colman (8), Richard Peperell (10), Raghu Iyer (16). David Hopkins (left), and Roger Goldring both made it to the last 8 of the 32 player field at The GC Veterans Championship today. Goldring exited at the quarter-final stage and Hopkins fell at the semis to the eventual winner David Wise of Australia. Carole Jackson, Mike Fensome and Helena Fensome were also at Southwick (near Brighton). Carole Jackson and David Hopkins called in on Winchester on their way back from the GC Veterans at Brighton, to represent Phyllis Court AC 'A' in the top flight A-League. Unsurprisingly, the hosts (who had chosen the dated of course) fielded two star players, and why not. They won both games and the match. PCC AC 'A': Carole Jackson and David Hopkins. 29-30 July - Norris is our star at the Wiltshire Open - as the AC World Champion found out! Ian Norris (left) was easily the best performer of the Phyllis Court quintet at Hamptworth this weekend - he reach the main event semi-finals (a first for him at this Championship level) and took the middle game of three fro the AC World Champion Stephen Mulliner! Norris eventually finished fourth, which is enough to open up the possibility of being offered a 'call-up' to the end of season English National Singles Championship (for the Ascot Cup). Chris Roberts, Peter Haydon, Helena Fensome and Mike Fensome all contested lower places. Congratulations to Peter Haydon who beat three 'minus 1' players at the Wiltshire Open, on the way to reducing his handicap from 2 to 1. 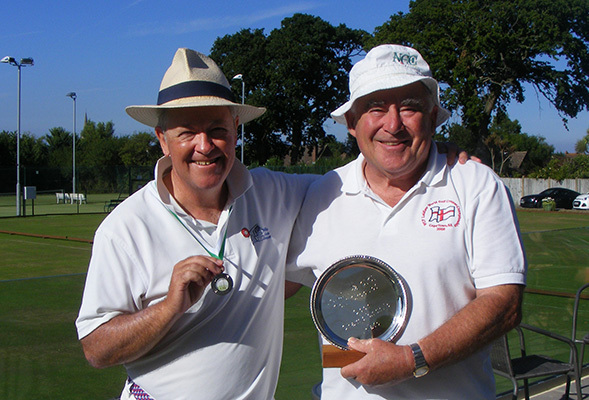 Chris Roberts (left) win five out of six games to lift the Open Singles 'Blue Ball' trophy for the second time today. But the surprise package was robin Coates who, despite being the 'outsider' on paper, some four handicap ranks higher than his next nearest competitor, performed excellently, got two 'scalps' and very nearly caught Roberts out too! Congratulations to Roger Goldring who had a good weekend at the Ipswich Open before triggering a handicap drop in finnishing runner-up in our 'Blue Ball' today.